Christmas and the holiday season is around the corner and it’s not too late to pick up a perfect gift for that special Off-The-Shelf Hacker. Hey, maybe a little something for yourself, too. Last year I scored a 3.5” color touchscreen Pi-TFT Display. The year before, some DigiSparks appeared in my stocking. Geek, nerd, engineer, hacker. Yup, I’m sure readers can relate. Have you seen the new five network FiPy developer board? 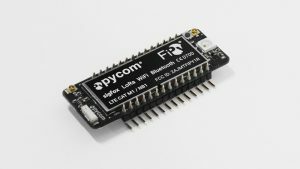 Perfect for Internet of Things projects, its specs include an ESP32-based main processor along with WiFi, BLE (Bluetooth Low Energy), cellular LTE-CAT M1/NB1, LoRa and SigFox. The network processor handles all the radios and network communications stacks, leaving the main processor entirely free for user applications. There’s also an additional co-processor that can monitor GPIO pins, the ADC channels and most of the internal peripherals when the device is in deep sleep mode. Hardware floating-point acceleration works on both cores. There are up to 22 GPIO’s available, including pulse-width-modulation, 12-bit analog channels, 64-bit timers, I2C, SPI and so on. A built-in real-time clock rounds out the package. Who would have known? My recent “Radios, Radios Everywhere” Off-the-Shelf Hacker column discussed the different types of radios and networks available to the DIY/Off-The-Shelf Hacker. Now the FiPy was just released on Kickstarter. I must be psychic! And, no, I have no financial or any other interests in the company. Maybe a physical computing book would work. Might as well get one written by the master, Tom Igoe, of Arduino and New York University Tisch School of the Arts fame. If you look closely in the Arduino IDE’s example programs you’ll see a bunch of Igoe’s comments mixed in with the code. Igoe’s “Physical Computing” is the bible for Off-The-Shelf Hackers. 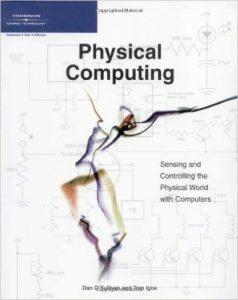 Although a few years old, the text leads readers through basic electronics, hardware and physical computing code strategies. Igoe also includes real-World projects he built, thereby illustrating his topics. You can’t go wrong with this one. The follow-up “Making Things Talk” extends Igoe’s discussion to include networking, communications and radios. It covers more recent hardware than in the Physical Computing book, as well. We’ve talked about the physical computing “stack” here before and Igoe’s book does a good job of introducing the reader to the main concepts. The Pocket CHIP is a little 4.5” x 6.5” PCB (printed circuit board) handheld computer, based on the $9 CHIP. It has a 4.5” touchscreen, color LCD display, a 5-hour rechargeable LiPo battery and a very clicky flexible membrane keyboard. It runs various flavors of Linux and is a nice little package for hacking, gaming and learning about microcontrollers. Connectivity is handled by onboard WiFi and Bluetooth. Admittedly, the default user desktop is pretty basic. Running XFCE was challenging because the small screen is pretty cramped. Nevertheless, at around $70, you get an awful lot of computing power in an interesting little device. There are even solder pads across the top of the device, that connect to most of the CHIP’s pins. It’s really a pretty good idea. Instead of scrolling through playlists on your phone or banging out a text on the old Galaxy 5S, the Dashbot picks up your voice with two specialized microphones and some digital signal processing magic to make hands and eyes-free operation seamless and easy. The same goes for directions and maps. It works without you having to look at your phone. 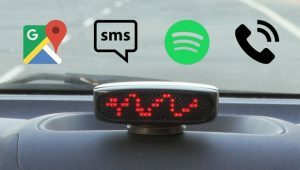 Not only will it give you audio responses, there is a bank of LEDs on the front of the Dashbot, that point you in the right direction. Lastly, the device is based on the Next Thing Company’s CHIP computer. So, there’s the potential to mod the hardware, software and the firmware. I couldn’t tell from the website when any of the documentation would be available, though. Off-The-Shelf Hacker tech is constantly evolving and I’m happy that people keep coming up with crazy new ideas like the FiPy and Dashbot. I’m anxious to see what the Christmas list looks like come November 2017!